Kooser served as U.S. poet laureate from 2004 to 2006, one of the first poet laureates to be selected from the Great Plains, and during that time, his book Delights & Shadows (2005) won the Pulitzer Prize for poetry. He also began a weekly newspaper column called “American Life in Poetry.” His goal was to introduce simple poems about ordinary subjects to people who might not otherwise read poetry. He lives on a 62-acre spread near Lincoln, Nebraska, with his wife, Kathleen Rutledge. His latest collection, Splitting an Order, was published by Copper Canyon Press in 2014. Could you tell us about growing up, your family? My father managed a store in Ames, Iowa, which was then a small college town, and my mother was a traditional homemaker. My parents had the requisite two children, myself and my younger sister. We were never affluent but never hungry either. I had a very happy middle-class childhood with a number of friends in a friendly town. Did you read a lot as a child? What sorts of things, if so? I did read a lot, books like Treasure Island, Kidnapped, Gulliver’s Travels, Hans Brinker, or the Silver Skates. Our family had a shelf of books, too, with Balzac’s collected stories; a handsome set of Alexandre Dumas, père; a collected Shakespeare; but those were mostly for looks. Having a nice shelf of books meant that though you didn’t have much money, you were rich in other ways. I now own somewhere around 10,000 books and feel very rich because of them, even though many of them were purchased for a quarter at yard sales. The Ames Public Library was just three blocks from our house and I was a steady patron. I can call up the smell of that building in an instant: ink, bookbinding glue, and so on. The first job I had, at about age 12, was making posters for the library. Do you remember what first prompted you to write? I wrote poems in grade school, but we all were encouraged to do that. By the time I got to the 9th grade, I got the idea that I could be mysterious and attractive to girls if I were an artist or a poet. I didn’t have much else going for me, had no athletic ability, couldn’t play a musical instrument. But I could write poems, and I had girls for motivation. And, yes, it worked. Where do the subjects of your poems come from? A strong sense of place is nearly always present. All of my poems I really care about come from experiences I’ve had, things and people I’ve observed. Fiction has no place in my work. In this postmodern age I’m out of place, believing as I do that a poet is someone who actually witnesses something and truthfully reports back. Can you talk about your poem “Splitting an Order,” which was recently featured on The Writer’s Almanac? It is also the title of your latest collection of poems. Can you speak about the book as a whole? How are the poems arranged? Did you enjoy the process of putting it together? That poem had its origin when I watched an older couple in a restaurant, splitting a sandwich. I used it as my title for the book because many of those poems are about ways in which people help one another. The way my books come together is one poem at a time. I never have a plan. Day after day I try to write single poems as best I can, and then after the best of them have been in literary magazines, I spread them on the floor and shuffle them around until I feel satisfied with the arrangement. There’s the book. Yes, certainly. When I was young I subscribed to the idea that poetry was made up of elevated language, put forth in elegant forms like the sestina and villanelle and sonnet. Now I believe that poems are most effective with readers when they sound like everyday speech. Thus I moved from metrical verse over to free verse. 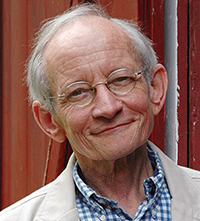 Michael Dirda, writing for The Washington Post, said: “Ted Kooser must be the most accessible and enjoyable major poet in America. His lines are so clear and simple.” Your poems often elevate the ordinary. Do you pay careful attention to how they may be received by a reader — that is to say, an average person who may not be coming to the poem(s) with an academic or literary background? That was a very kind thing for Michael Dirda to say. Yes, l do have an imaginary reader, a person with maybe a couple of years of education beyond high school, someone who’s probably never heard of Wallace Stevens. I want a broad popular audience, not a literary one. My mother had a couple of years of college, liked to read, and I still think of her when I’m writing, though she’s been gone 16 years. She didn’t discriminate between acceptable books and unacceptable ones. She read all the Reader’s Digest Condensed Books, and she learned something interesting from every volume. She was open to anything she might come upon, and she’d try to find some practical use for it. What are the poems (by another poet) that you go back to again and again, ones that never fail to awe or inspire or delight you? You are the editor for “American Life in Poetry,” a national weekly newspaper and online column. Do you pick the poems yourself? What motivated you to start the project? “American Life in Poetry” is free, and that’s part of why it’s been so successful. Most newspapers wouldn’t pay five dollars a week for a poetry column, but they’ll print it if it’s free. I started the project in 2005 when I was U.S. poet laureate, and it has grown and grown over the past 10 years. We now have three and a half million readers in print and on line. I do pick the poems we print, but I have excellent help from a part-time assistant editor and a graduate student who try to find poems that might work for the column. I might say that the audience I imagine for this column is very much like the imaginary reader I mentioned above. The column is for everyday readers, not literary professionals. I see The Writer’s Almanac as having much the same audience, and you do a marvelous job of getting poetry in front of your audience every day. I only have to do it once a week! What advice would you give to someone who wants to become a poet? Read, read, read. We learn to write from reading. Nearly every poem that fails fails because its author hasn’t read enough poetry. I tell my students that they ought to read a hundred poems for every one they try to write. And we learn as much from poorly made poems as we do from the really good ones.